On Sunday 25th June at 5am, Team Mountain Fuel made fell running history with the first competitive head-to-head race involving the Billy Bland Challenge and with that six records. The challenge is based on the famous Bob Graham round and is a 66 mile, 42 peak challenge with a 24hr time limit It is considered one the biggest challenges in English fell running, involving a 27000 ft of ascent up Skiddaw and Blencathra, over the Helvellyn range, the Langdale pikes, Scafell, Wasdale and Great Gable, starting and finishing at the Moot Hall in Keswick. Two mixed teams of men, women including vets and open runners raced against each other in an attempt to beat the mixed team record of 16hrs 49 minutes with aspirations of also being one of the fastest times and getting close to legendary fell runner Billy Bland’s time of 13hrs 53 minutes on the Bob Graham Round. Both teams consisted of 10 runners, with two runners each running one of the five legs together. The team was made up of a collective mix of ultra, trail and fell runners, including local Keswick AC runners (some of whom hold individual leg records and were part of the Keswick AC record breaking time of 12hrs 25 minutes) along with other Team Mountain Fuel runners from around the country, including some Team GB Mountain Running representatives. Despite being a mixed team which also included vets they managed to record the second and third fastest times in the history of the Billy Bland Challenge being 12 hours and 51 minutes and 13 hours and 1 minute and on top of this records were broken records were broken on every leg of the round. It was a damp, cloudy and windy start at 5am with leg 1 starting from the Moot Hall in Keswick, crossing three fells and finishing in Threlkeld. 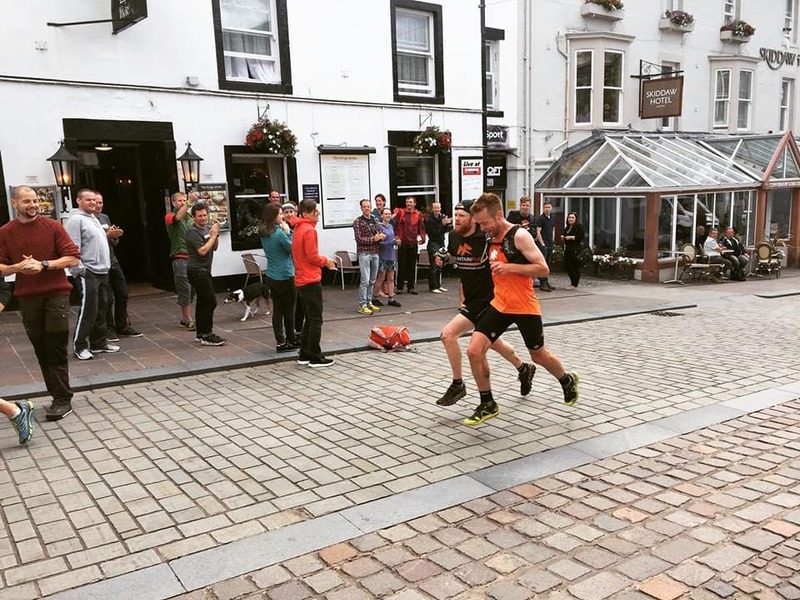 The first leg was a battle of the over 40 vets (closer to 50’s for 3 of them) and saw co-owner of Mountain Fuel, Rupert Bonington run with Kirsty Hall a British Champion Fell runner versus local Bob Graham legends Andrew Slattery and Steve Angus. After slogging it out over 12 miles and 5500ft of ascent over fells, bogs and a river the race came to the final descent and around 1 ½ miles where both teams chose to race down the steepest slope of Blencathra, the route is aptly named by locals as the Parachute drop due to its steep nature. After running down rocky scree, sliding down steep grass and stumbling though heather and bracken then fording back and forth across steep mountain streams Rupert and Kirsty completed the leg in 2 hours 40 mins to record the fastest time for a mixed pair. Unfortunately, due to a sprained ankle injury Steve and Andrew finished the leg a few minutes behind in 2 hours 43 minutes. 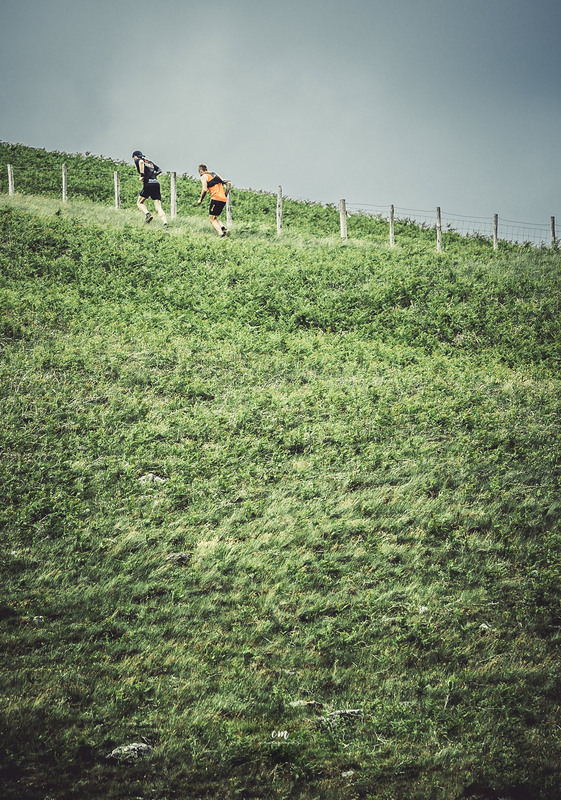 Leg 2 is seen as a leg with plenty of good running despite its steep climbs, once up top you run across the undulating Dodd fell tops to Helvellyn and finish with a couple of steep sharp climbs and descents to Dunmail Raise. The leg saw fell running champion Ben Mounsey and local top fell runner Calum Tinnion versus international mountain trail runner Alex Pilcher and Ultra Runner Mārcis Gubāts. Ben and Calum’s fell experience proved its worth as they were able to work together to navigate the leg at break neck speed knocking 7 minutes off the leg record finishing in 2 hours 20 mins some 40 minutes ahead of Alex and Marcis who unfortunately had navigation issues. This leg is around 13 miles and 6000ft of ascent and covers 12 fell tops. 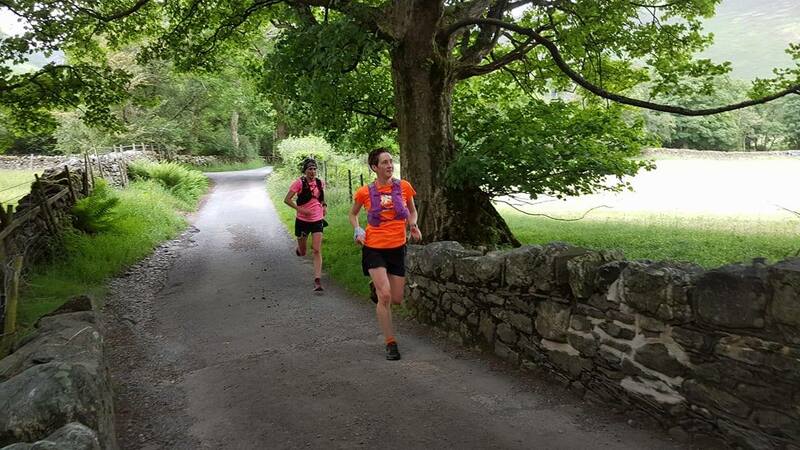 Leg 3 is a tough one with every type of terrain that the Lake District can throw at you, including a climb if you choose to scramble up the nerve jangling Broad Stand (Thank you to Keswick AC ladies who had a handy rope set up for their record breaking attempt). This leg also includes Englands highest peak, Scafell Pike. James Appleton and Mark Lamb had it all to do as their team was some 45 minutes behind the pairing of veteran Phil Winskill and Mark McGoldrick, however somehow they managed to close the gap between the teams to 5 seconds by the time they sprinted into Wasdale in a record breaking time of 3 hours 2 minutes, this knocked 8 minutes of the previous record which James was also a part of and now also means that mark hold the fastest mens times for Leg 1 and Leg 3. This was a phenomenal feat having ran 15.5 miles with 7400ft of ascent while ascending and descending 15 fell tops. Phil and Mark completed the run in a fast 3 hours 45 mins. Leg 4 climbs out of the Wasdale valley up the steep face of Yewbarrow and it was here that the chase was on. Having a 5 second lead meant that the teams ran head to head with the lead changing hands over and over again until Jacob Snochowski and England Mountain Runner Nichola Jackson managed to pull away between Kirk Fell and Great Gable. By this stage, Ultra Running veteran Dave Troman was struggling as he’d had to run so fast he’d not drank his energy fuel, his fell running partner Lee Newton, had managed to drink both his bottles and was still going strong so turned his attention to Dave and through sheer grit and determination they battled on scrambling up and over the rocky terrain. Jacob and Nichola were incredible beating the men’s record by 19 minutes at 2 hours 36 minutes with Lee and Dave also coming in under the record in 2 hours 41 minutes. This time was an hour quicker than when Dave had last run it as part of the vets team and 29 minutes quicker for Lee in comparison to his time the previous year! 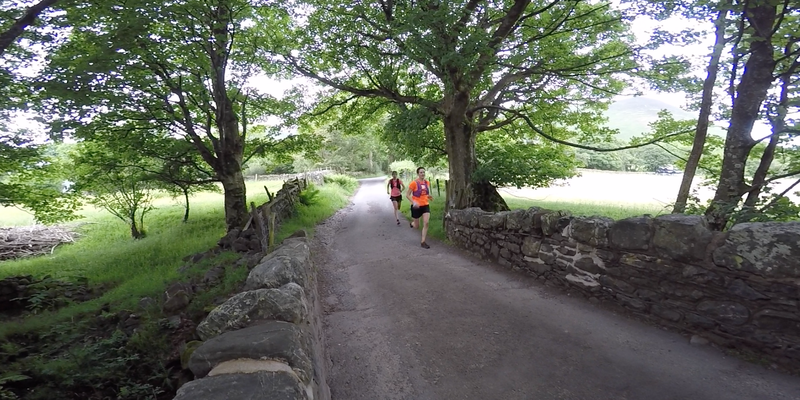 The teams ran just over 11 miles with around 6200ft of ascent while ascending and descending 9 fell tops. Leg 5, the finale. Ten minutes separated the teams and as the pace was so fast they were very nearly caught out as they’d been enjoying the views relaxing. No time for a warm up and the first team were off, Dan Page and Ste Lord, both experienced Ultra Runners, but by no means fell runners and they were up against veteran ladies and GB vest Mountain Runners Sally Fawcett and Julie Briscoe. The final leg consists of 3 fells and a 10k road section and while being marginally the shortest is equally brutal due to the transition from fell to road and the speeds you can travel. 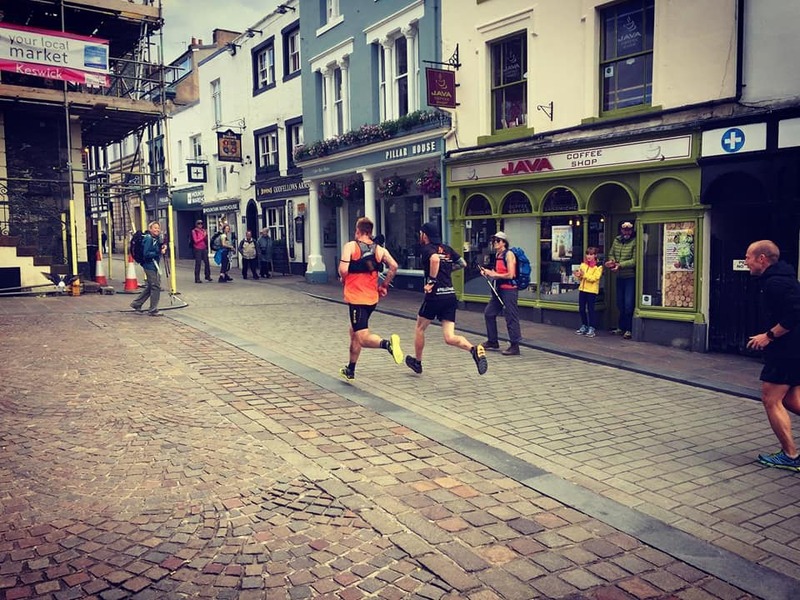 Dan and Ste ran an incredible leg based on their experience and were able to touch the Moot Hall door to stop the challenge in 1 hour 28 minutes having managed some sub 5 minute miles across the 11 miles and 2400ft of ascent. 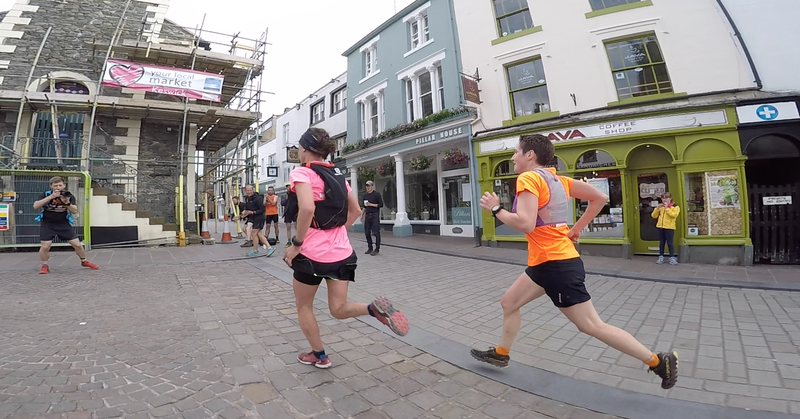 Sally and Julie were equally amazing creating a new fastest ladies time of 1 hour 35 minutes which included 6 minute miles on the road section back to the Moot Hall. The teams were roared home by everyone involved, from the team who were up on the fells filming and photographing to the friends who drove runners around the Lakes, this was a special moment for everyone. This is not a race where you win a medal or a t-shirt, there is in fact no official race. This is a challenge for clubs or teams to have a fantastic time on the fells and attempt to post their fastest times. Having it as a head to head race certainly helped the teams run faster and made it more of a spectacle for all involved and already the gauntlet has been laid down as co-owner of Mountain Fuel and Keswick AC club member challenged local rivals Helm Hill veterans team to a race the following year as they have recently recorded the fasted veterans time, taking the title from Keswick. This challenge has been accepted as we hope many other clubs and teams do so in years to come.